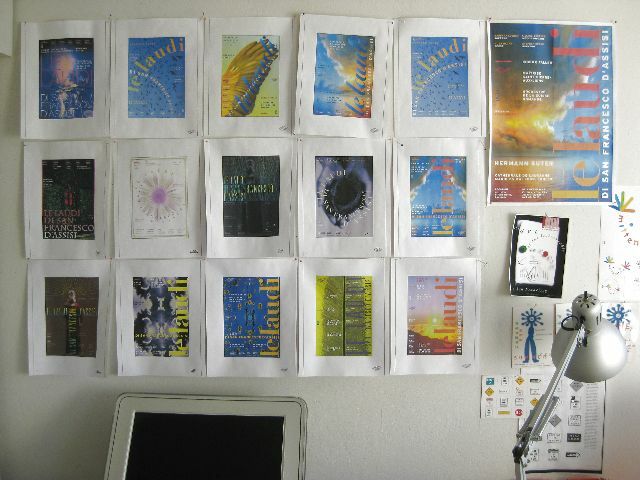 A wall in Jean-Benoit Levy's studio in San Francisco Sometimes, I have the impression that making posters is quick and easy. 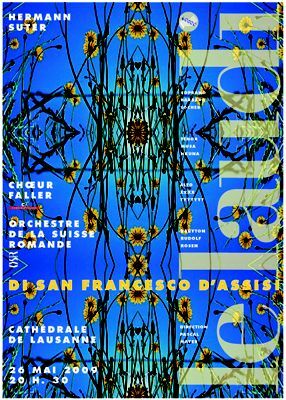 It is often not obvious for an outsider how much and what kind of work goes on behind the scenes before a poster finally hits the streets. 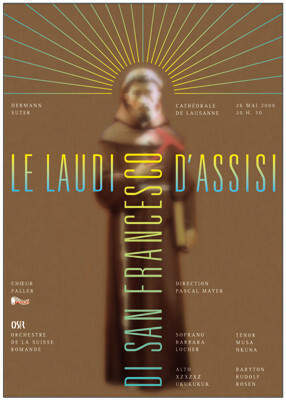 I therefore appreciated it when Jean-Benoit Levy offered to show us the different designs he tried out for a poster for a concert perfomance of Le laudi di San Francesco d'Assisi in Lausanne, Switzerland. 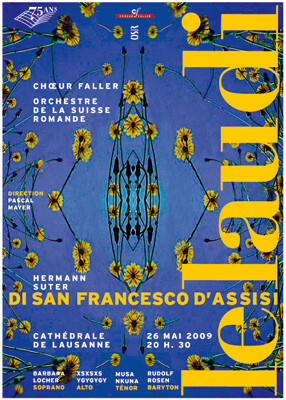 Jean-Benoit Levy writes : To develop a poster for the Choeur Faller is every time a challenging creative experience as by the classical nature of the client, it pushes the designer toward a rather classical result. 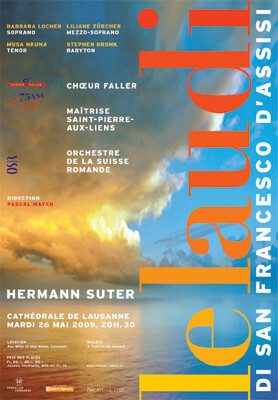 Promoting one single representation of the Choeur Faller on Tuesday May 26, 2009 at the Cathedral of Lausanne – which features Le Laudi di San Francesco d'Assisi, an Oratorio of the Swiss composer Hermann Suter created in 1923 – this street poster had to be effective and simple. 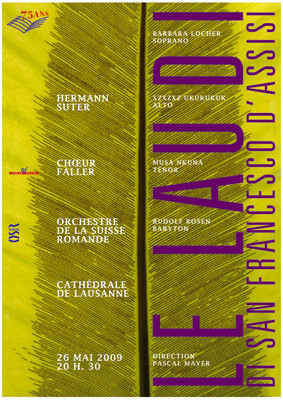 The president of the Choeur Faller, Jacques-Henri Addor, have expressed very clearly his needs of simplicity and readability, directing the designer trough each main decision, almost acting like his creative director. 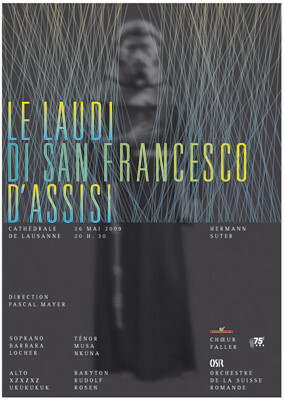 The first sketches have been presented in December 2008 and the final poster found it's actual form in March 2009. 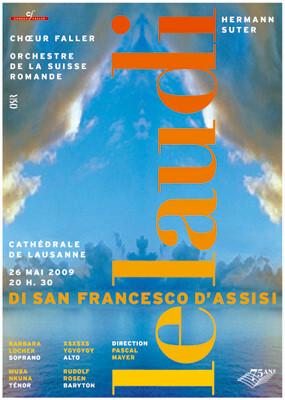 In his research, designer Jean-Benoit Levy discovered that in San Francisco – the city is named after Saint Francis of Assisi – there is a replica of a small church which the popular saint had decided to rebuild in italy in sign of his faith around 1206, after his crusade in the middle east. 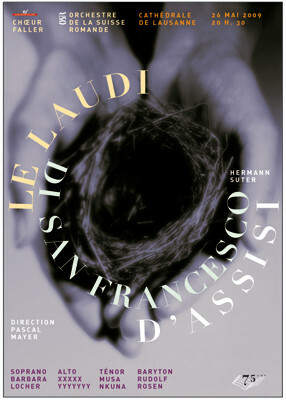 JBL also discovered the beautiful 1950 black and white movie "The Flowers of St. Francis" directed by Roberto Rossellini and co-written by Federico Fellini and played by non-professional actors which were priests. 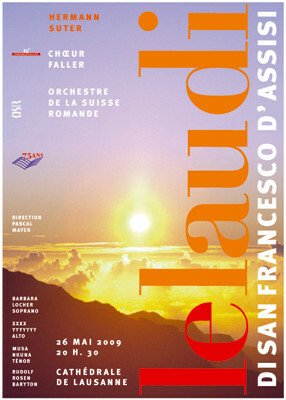 During this creative process, it appeared that the poster had to contain both, the symphonic character of the musical piece, and a relation with the nature. 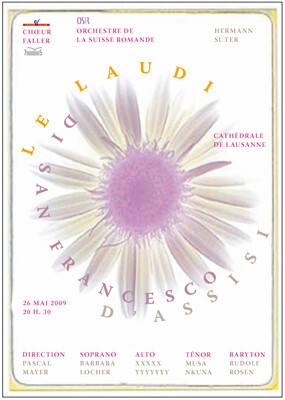 Neither dark nor sad, rather representing the rebirth of the nature in Spring, the poster had to support a certain sacrality without being religious. 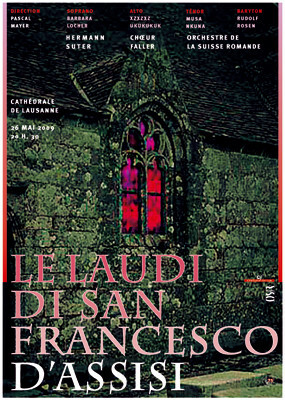 Therefore, all elements representing a direct relation with the catholic religion have been avoided later on during the selection process. 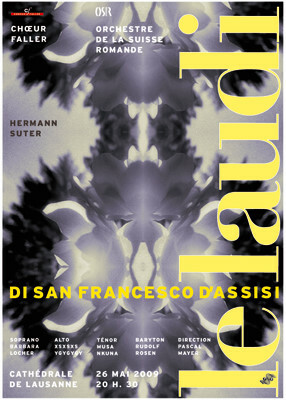 In this series, one can discover and follow the journey of the designer from his free research until the final result. 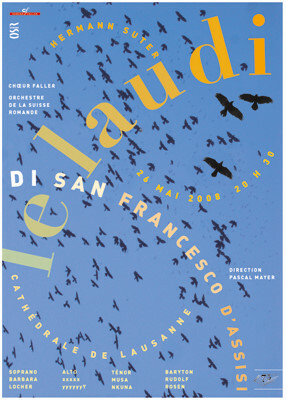 Working with photographical material of several San Francisco photographers, but this time definitely in majority with creations of photographer Daniel Furon , J-B Levy is following his beloved dialog between photography, color and typography. 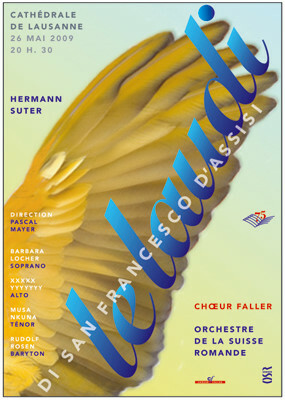 In parallel, a flyer, a small poster, a program and a CD cover have been adapted and are promoting this musical creation which celebrates the 75 th anniversary of the Choeur Faller. 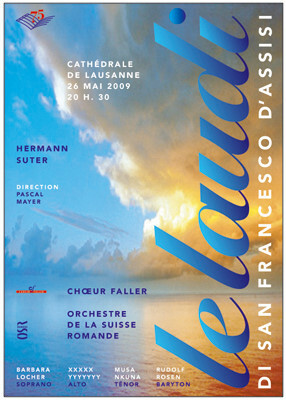 In this occasion, a logo had also to be designed by JBL in order to support the main visual theme.